With the Akiles DuoMac 421 you can bind documents with both 4:1 pitch spiral coil and 2:1 pitch twin loop wire. The DuoMac 421 is the only combination machine of its kind. The unique design of the 421 includes a the ability to punch both a 4:1 pitch hole pattern for spiral coil binding and a 2:1 pitch hole pattern for twin loop wire binding up to 1-1/4". This gives you the ability to choose the look and feel of your coil bound books and presentations. Four to One pitch coil (4 holes per inch) is the standard pitch of spiral coil used for binding presentations, proposals and books. Normally, you would have to use two different binding machines to do the same tasks as the DuoMac 421. Now you can choose between these two great binding styles for all your reports and presentations and you can also save space, time and money. Welcome to MyBinding video. Today we’re looking at the Akiles DuoMac 421, a 4:1 coil and 2:1 wire binding system. This heavy duty machine is designed to provide organizations the choice between three different styles of binding. Step-by-step, let’s watch it in action. This is 4:1 coil binding. With your project all ready to punch, set the side margin control knob to make sure that all punches are consistent throughout your project. Simply set it for the size paper you need and clamp down the dial. And pull out any of the disengageable die pins according to the size paper you have, so you have no half punches. Pull down on the long, more-forward arm and your holes are punched. Continue to punch through the rest of the pages in your project. And now it’s time to bind with your 4:1 pitch spiral coil binding. You can do so by hand or with a separate machine. And that’s basically it with 4:1 binding with the DuoMac 421. There’s also an adjustable depth of margin punch control knob on the right hand side so you can punch a deeper, much more stronger margin, for a larger project. This is punching and binding with 2:1 pitch twin loop wire. With your materials ready, slide them into the upper chamber, the open throat of the 2:1 punch. Use the side margin control knob to set the setting so that all punches are consistent throughout your project. Pull the disengageable die pin that you need for your size project to assure there are no half punches. Use the long arm in the back and make your punch. Continue to punch through the rest of the materials in your project until they’re all done. There’s also an adjustable depth of margin punch control knob on the right hand side so you can punch a deeper, much more stronger margin for larger projects. And with your punches made, it’s time to bind. This punch pattern will also let you use 5:1 spiral coil binding spines. In wire binding, there’s a little trick where you can hide the seam of your final bind. Simply take the last page and flip it over so the back of the back faces the front of the front. There are two guides on the front of the DuoMac that help you choose the right size coil and make the right setting with the dial on the right hand side so the closer closes no more than needed. These are very important settings. Next, drape your wire over the wire fence in the front. And then thread your punched project over the teeth of the wire spine. This can be a bit tricky to do but with some practice, you’ll become quite proficient. With all the teeth through all the wholes in the project, you are ready for closing. Remove the spine from the fence and turn it with the “C” shape facing down into the closer flat along the bottom. Pull down with the arm until it stops and you’re done. And because of our little trick at the beginning, the seam of the spine is hidden between the last page and the back cover. And it’s that simple with the DuoMac 421 by Akiles. For more demos and reviews of this product and many more, check out MyBinding.com. Transcript: Welcome to MyBinding video. This is a look at 2:1 wire binding on the Akiles DuoMac 421. This heavy duty machine is designed to provide organizations the choice between three different styles of binding. Step-by-step, let's watch it in action. Welcome to MyBinding video. This is a look at 2:1 wire binding on the Akiles DuoMac 421. This heavy duty machine is designed to provide organizations the choice between three different styles of binding. Step-by-step, let's watch it in action. This is punching and binding for 2:1 pitch twin loop wire. With your materials ready, slide them into the upper chamber, the open throat into the 2:1 punch. This punch pattern can also be used with spiral coil binds. Use the side margin control knob to set your setting so that all punches are consistent throughout your project. Pull the disengageable die pin that you need for your size project to assure there are no half punches. Use the long arm in the back and make your punch. Continue to punch through the rest of your materials in your project until they're all done. There's also an adjustable depth of margin punch control knob on the right hand side so you can punch a deeper, much more stronger margin for larger projects. And with your punches made, it's time to bind. This punch pattern will also let you use 5:1 spiral coil binding spines. In wire binding, there's a little trick where you can hide the seam of your final bind. Simply take the last page and flip it over so the back of the back faces the front of the front. There are two guides on the front of the DuoMac that help you choose the right size coil and make the correct setting with the dial on the right hand side so the closer closes no more than needed. These are very important settings. Next, drape your wire over the wire fence in the front. And then thread your punched project over the teeth of the wire spine. This can be a bit tricky to do but with some practice, you'll become quite proficient. With all the teeth through all the wholes in the project, you are ready for closing. Remove the spine from the fence and turn it with the "C" shape facing down into the closer flat along the bottom. Pull down with the arm until it stops and you're done. And because of our little trick at the beginning, the seam of the spine is hidden between the last page and the back cover. And it's that simple with the DuoMac 421 by Akiles. For more demos and reviews of this product and many more, check out MyBinding.com. Transcript: Welcome to MyBinding video. 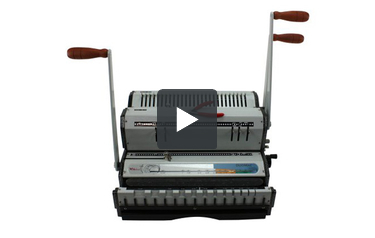 This is a product review of the DuoMac 421, a 4:1 coil and 2:1 wire binding machine by Akiles. The DuoMac 421 is a big machine. It weighs a lot, can do a lot, and yeah, costs a lot, too. So let's take a review and a good look at the $700 multi-purpose punch and binding system. Welcome to MyBinding video. 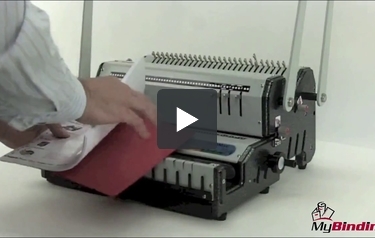 This is a product review of the DuoMac 421, a 4:1 coil and 2:1 wire binding machine by Akiles. The DuoMac 421 is a big machine. It weighs a lot, can do a lot, and yeah, costs a lot, too. So let's take a review and a good look at the $700 multi-purpose punch and binding system. It can punch two different punch patterns: a 2:1 thick that can be used with twin loop spines but also could be used with 5:1 pitch spiral coil binds. It also punches circular holes for 4:1 coil. Altogether, this machine can punch holes then for three different kinds of binds. This machine is built like a tank; it's solid metal. Even the side margin control knob for both 4:1 and 2:1 are solid metal and are sturdy as can be. The 4:1 has an open throat design and is 13 inches wide with five disengageable punching pins. These disengageable dies allow you to punch the most common paper sizes: letter, legal, A4, half-letter, and A5 with the option of doing longer if needed. Two to one punch is 14 inches long, open throat, and offers fully disengageable punching pins. This means it's possible to punch any size document up to 14 inches in length, actually longer, with a 2:1 pitch rectangular hole pattern. All three handles are sturdy metal with comfortable wooden grips. Depth margin control knobs provide the correct margin depth for each wire and comb size, which maximizes document tear resistance. Punch capacity is decent with 14-17 sheets of 20lb paper per lift. A large limitation to first note is that with coil binding, there is no coil inserter, so this has to be done by hand or by a separate machine. This limitation is a bit annoying, especially for the price. When it comes to binding with wire, the DuoMac 421 has a couple of helpful features. Two measuring grids at the front help you pick the right size coil for your project and the dial on the right allows you to set a stop on the closer for that size wire so you don't over-close. There's a built-in wire fence on the front of the machine that's helpful and sturdy; however, it could be a little further away from the machine. This would be helpful in what is probably the most difficult step in wire binding. Overall, the machine has a lot of great features and really can perform a lot of functions. However, if you're new to wire binding or new to this kind of machine, it would be pretty confusing and pretty intimidating. But if you've been doing wire binding for quite a while and had to use many different machines, this would be heaven sent. The waste tray is ample in size and accessible from the front; we like that. All-in-all, this is a great machine and does a great job. However, the price is just under $700, so the investment is worth really thinking about. For reviews more and demos of this product and many more, check out MyBinding.com. The Akiles DuoMac 421 is a combination binding system that offers medium volume users with three different binding styles. Here is a list of what we consider to be some of the strengths and weaknesses of the DuoMac 421. All told, you can bind documents in three different styles with the DuoMac 421. First of all, using the 4:1 pitch punch, you can make books that utilizing standard four to one pitch spiral coil. The 2:1 pitch punch function allows for the corresponding twin loop wire, and you can also use it to bind thick books if you use 0.400 pitch spiral coils. On the four to one side, you'll find a thirteen inch throat with a strategically-placed five disengageable pins. Depending on which pins you choose to disengage, you will be able to bid documents that are the more common letter and legal sized, as well as A4, A5, and half letter sized documents. The two to one side is fourteen inches in length, and gives you the ability to disengage whichever punching pins you choose, meaning that you can punch documents up to fourteen inches in length. Both of the DuoMac 421's punches feature open-throated designs which means that using a fairly easy two step process, you can punch documents of just about any size. In order to do that, all you will have to do is to punch one side of your stack, then flip it over and punch the other. Akiles saw fit to include a really high-quality wire closer on the front of the DuoMac 421. With a lot of the other wire closers we have seen over the years, we've doubted their durability and have seen some of them start to lose accuracy over short periods of time. The high quality steel construction of these wire closers, however, left us impressed, and we see no reason why they shouldn't last a good many years. Along those same lines, we have to say that we appreciated the fact that Akiles includes a pair of crimping pliers with the DuoMac 421. These pliers are essential to the process of spiral coils binding, and a thirty dollar value to boot, which is nothing to sneeze at. One thing that we missed having on the DuoMac 421 is a spiral coil inserter. 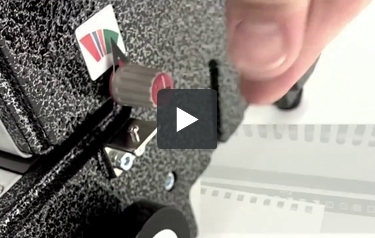 Spinning your coils onto you document by hand is no bid deal if you are only doing a few (and we mean a very few), but if you are going to be producing any sort of volume at all, you will need to look for a standalone coil inserter. Akiles recommends that the Roll @ Coil be purchased to go along with the DuoMac 421. It's not a very expensive addition, but it is something that you should be aware of. Because it includes so many features, inexperienced users may be a little intimidated by the look and operation of the DuoMac 421. It's got handles and levers and buttons all over the place and looks perhaps a little bit like a misplaced octopus. You really won't have much trouble figuring it out, though, just be aware that it will just take a little bit of a learning curve.